The RDL SF-DN4 is used to convert up to two stereo digital audio sources to four Dante channels without leaving the digital domain. 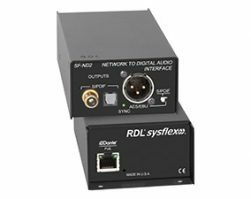 The SF-DN4 is PoE powered and offers selectable Dante Sample Rates of 44.1, 48, 88.2 or 96 kHz. 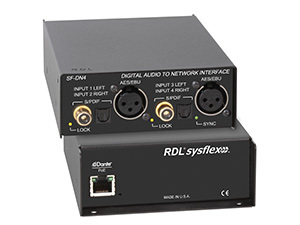 The interface automatically detects a valid input on the S/PDIF (optical or coaxial) or AES/EBU (female XLR) connectors at Sample Rates from 32 to 192 kHz. 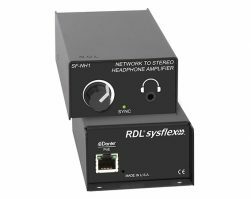 The SF-DN4 is constructed in a steel enclosure and may be used free standing. 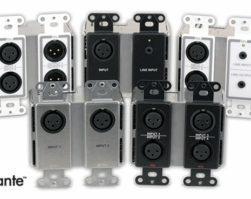 Accessories are available for mounting the interface in equipment racks, under counters or on microphone stands.